(Bloomberg) -- International Business Machines Corp. is scheduled to report its first-quarter results after the market closes on Tuesday, but when it does, IBM will not be the company that analysts are most interested in. The company in October announced that it would acquire Red Hat, and while the deal isn’t expected to close until the second half of the year, analysts are looking ahead to the prospects of the combined company, and whether Red Hat’s position in the fast-growing cloud-computing market will be enough to turn sentiment on IBM, which has lagged the overall technology sector for years. Shares fell 0.4 percent on Tuesday, but have risen about 34 percent from a nine-year low hit in December. 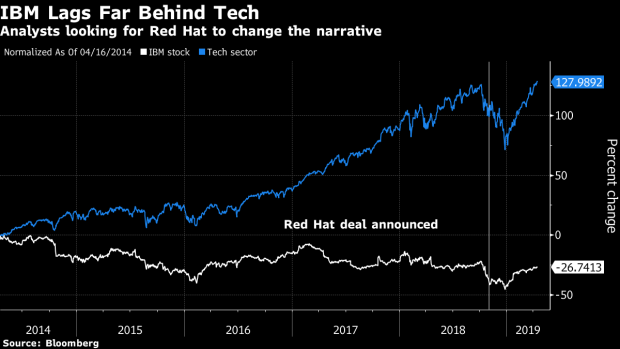 Credit Suisse cheered the Red Hat deal in a note published last week, starting coverage on IBM with an outperform rating and Street-high price target of $173. “IBM and Red Hat together form a powerful competitor to guide customers” into a “hybrid-first” world, analyst Matt Cabral wrote to clients. The bullishness of this view was something of an anomaly, however. Just six firms have a buy rating on IBM shares, compared with the 15 that recommend holding it. And while the company’s adjusted earnings haven’t missed expectations since the third quarter of 2014, according to Bloomberg data, it also hasn’t done much to inspire much enthusiasm. Both first-quarter earnings and revenue are expected to decline from the year-ago period.